As a pediatric physical therapist one of my main jobs is to work on gross motor skills. To work on these skills pediatric physical therapists come up with lots of different gross motor activities for kids! Gross motor activities are a great way to get kids up and moving. 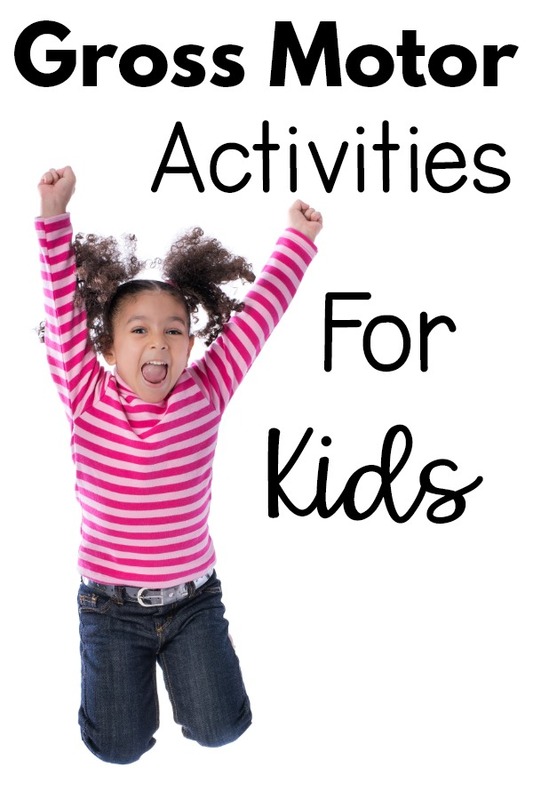 Let’s talk about activities that help kids work on gross motor skills! At Pink Oatmeal, we provide you with several different FREE gross motor activities and task cards in the freebie library. When you hear people say that they are working on gross motor skills or doing gross motor activities they are talking about activities that involve large movements of the body. Some example of gross motor movements that you do everyday include running, jumping, walking, crawling, and squatting. So, when someone is talking about gross motor activities they are talking about activities that involve these large movements of the body. Using games and play is a huge part of working on gross motor skills. Almost all play equipment on a playground allows kids to work on gross motor skills and is a VERY IMPORTANT part of a child’s school day. 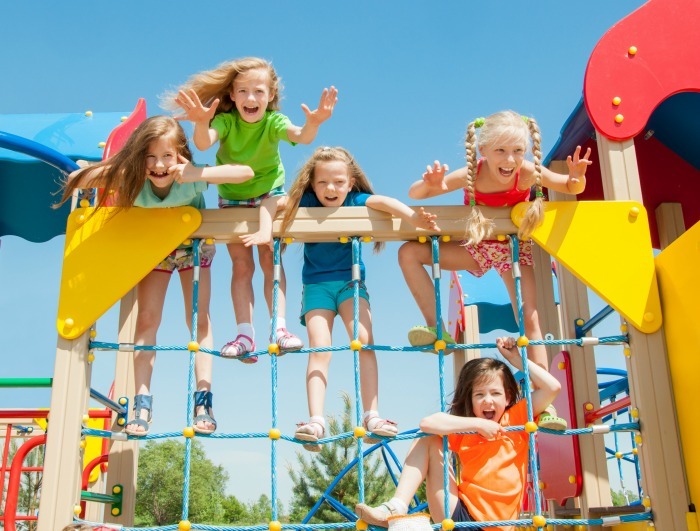 There are other great games that can be played on the playground and have been for years that don’t involve the need for fancy playground equipment. Hopscotch – Don’t forget about this game that has been around forever as it is a great gross motor activity! Four Square – Another great game to work on so many different gross motor skills! Tag – This can be in all forms. Traditional tag, freeze tag, TV tag etc. Gaga Ball – Have you heard of this yet? Many different playgrounds and schools are starting to have gaga pits. Jump Rope Games – Games like helicopter, snake, and partner jumping are all great ways to work on large motor skills. Tether Ball – Do you remember playing this game? It consists of a ball attached to a medal pole by a rope. Two players would try to hit the ball around the pole. I don’t see it as often on playgrounds anymore but it was/is a great game to work on gross motor skills. Gross motor activities can easily be brought right into learning when you have creative ideas for implementing it. The best part is the kids are having so much fun, getting in much needed physical activity, and learning all at the same time! Alphabet Yoga– Someone brand new to yoga to the seasoned yogi will love these fun ways to move and learn about the alphabet. Alphabet Movement – Fast, fun, and effective movements that go with different letters of the alphabet. Letter Recognition Activities With Movement – Get so many different ideas for adding movement in to letter recognition. Sight Word Motor Paths – Adding gross motor to sight words can be made easy by creating sight word paths where kids read the sight words as they move through the motor path. Scavenger Hunts – Making scavenger hunts related to learning topics is an excellent way to work on gross motor skills. Adding in skipping, jumping, galloping, walking backward etc to the scavenger hunt let’s you focus on the motor skills you want. Get FREE scavenger hunts in the Pink Oatmeal freebie library. Themed Movement – Adding movement that goes along with the different themes you are working on is easy when it is already done for you. Are you looking to add movement to your farm theme, circus theme, or space theme? It’s all done for you. Browse every themed activity and printable you could ever want in the Pink Oatmeal Shop. Numbers – This is one of the easiest way to add movement. When discussing numbers it is easy to add gross motor activities. For example, calendar time. If the date is the 15th you would have your kids do 15 jumping jacks. Get ready made number gross motor cards. Shapes Yoga – Have the kiddos make their bodies into different shapes. Alphabet Magic – Magically turn your body into the different letters of the alphabet. Using an exercise ball or small regular ball can be a fun addition to any gross motor game. Kids love all of these different activities and you can vary the challenge based on the age and ability of the kids you are working with! Finding fun ways to work on balance can be achieved with some of these fun gross motor games. Have you found some ideas that look fun to use? At Pink Oatmeal we have even more to help you with your gross motor activity planning. Check out the entire section of the website dedicated to gross motor planning (and fine motor skills too). This will help make all of your motor planning a breeze!